Is there a better alternative to Wooden Puzzle Widget? Is Wooden Puzzle Widget really the best app in Arcade category? Will Wooden Puzzle Widget work good on macOS 10.13.4? 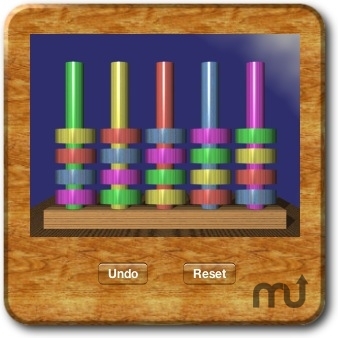 Wooden Puzzle Widget is a little puzzle, based on a wooden toy I once saw, is more difficult than it looks! The idea is simple. You have to get all of the pieces onto their respective coloured pegs (ie the blue pieces on the blue peg, red on the red, etc). You can move one or two pieces at a time, but only so the colour of the piece you are moving (or the bottom one if two) matches the piece you are moving it to. If moving to an empty peg, the piece must match the colour of the peg. You can't have more than 7 pieces on a peg. Wooden Puzzle Widget needs a review. Be the first to review this app and get the discussion started! Wooden Puzzle Widget needs a rating. Be the first to rate this app and get the discussion started!